Photo of a plumber by Boise Plumbing/Flickr. The difference between a plumber and a master plumber depends on licensing and regulations by state. In some states, there are 2 or 3 tiers of licensing and certification for people in the plumbing profession, while others have less rigid regulations. 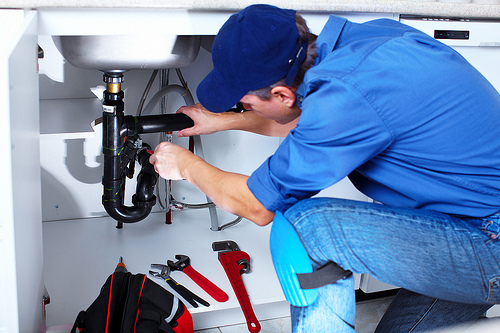 The most important difference between a plumber and a master plumber is that master plumbers have much more experience and usually are familiar with business management and related subjects, while plumbers, also called "journeyman plumbers," tend to have less experience and focus only on the plumbing aspects of their work. Future plumbing contractors typically learn these skills on the job as apprentices, although some vocational schools offer plumbing training. Trainee or apprentice plumbers work under the supervision of someone with experience—often a master plumber. Experienced plumbers provide tips and tricks and gradually allow their apprentices to work with less supervision. In some states, only master plumbers are allowed to contract journeymen and apprentices to work under them, which can be one component of the difference between them and less skilled plumbing professionals. To be called a master plumber, it's usually necessary to pass an examination. Each state has its own prerequisites to take the test, which typically include a certain amount of prior training and experience, such as two years in a vocational school or four years as a journeyman plumber. Once people have clocked enough time in the plumbing profession, they can sit the exam to become a master plumber or, as they are known in some states, plumbing contractor. The examination includes a mixture of subjects. Some questions focus on plumbing-specific topics including questions about building code and how to approach various plumbing challenges. Others deal with business law, discussing contracts, obligations, and other aspects of the trade that a master plumber may encounter. These questions ensure that master plumbers are fit to draft contracts and will work professionally with their clients; the licensing process is designed as a form of consumer protection to help homeowners avoid unscrupulous or untrained contractors. After someone passes the exam and becomes a master plumber, typically the state issues a license number. It may be necessary to keep up with continuing education requirements, and some plumbing contractors also join professional organizations to stay on top of the latest developments in the field. Homeowners looking to hire a plumber are always entitled to information about his or her license number, experience, and training, and should request all of these details before entering into a business agreement.